Thanks to Bill Butler, there is a new, lower cost option for those out-of-town visitors that you just don’t have room for. Since writing this article the Bozeman Backpacker’s Hostel owner and founder Bill Butler unexpectedly passed away; leaving behind his lovely wife Lydia, a young son, and two local businesses (Pizza Campania and the Bozeman Backpacker’s Hostel). Bill was a very kind man, and great contributor to the Bozeman community. Our hearts go out to his family and friends, and we wish all the best to the continued success of both businesses. Some people call it summer, but not us Montanans. That impossibly short season sandwiched between mud and skiing is best known here as visitor season. And, it’s right around the corner. The bravest out-of-town guests will start arriving in May under the misguided assumption that, since it is spring everywhere else, it will surely be spring here. Instead, they’ll find that the rivers are blown-out, the hiking is unbelievably muddy, and even the backcountry skiing is slushy. By June, conditions improve and the less hearty visitors begin to arrive in droves. Keeping them entertained during the day is a cinch. Endless hiking trails, hundreds of river miles, awesome restaurants, and interesting museums often make visitors consider staying here forever. But, finding enough beds for everyone to sleep in can be a little more challenging. Bozeman’s hotels and lodges get expensive, especially for those who want to stay a while. Thanks to Bill Butler, there is a new, lower cost option for those out-of-town visitors that you just don’t have room for (like your sister’s boyfriend’s cousin’s friend). 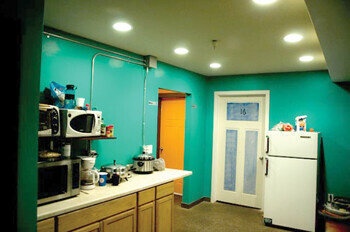 The Bozeman Backpacker’s Hostel recently opened in downtown Bozeman. The rooms are simple and sparsely furnished, but cost only $28 per night; a week’s stay costs just $210. The hostel’s 16 rooms do not have private bathrooms; those are shared along with a library, patio, kitchenette, and living room with a TV. Visitors must bring their own sleeping bags, or be willing to rent blankets and sheets. The entire place is underground, but skylights in shared spaces create an open feel. And, you can’t beat the location. The front entrance opens onto Main Street, just west of Black Avenue at 27 E. Main. There has been a lot of talk about the need for a hotel in downtown Bozeman, and the city has been asking for upscale hotel proposals for years. The most recent prospect, the conversion of the old armory building on W. Mendenhall, is still in the planning phases. The hostel may not be the luxury accommodations anticipated by some, but it fills a need for affordable lodging in the heart of the city and offers travelers a unique experience. The Bozeman Backpacker’s Hostel will run just like most European hostels in that the minimalist accommodations encourage guests to gather together in the common rooms. Part of the allure of staying in a hostel is the opportunity to meet someone from the other side of the world. Hostels tend to attract younger, adventurous travelers and can be perfect for those long-lost acquaintances that start appearing on the doorstep during the summer months. We are lucky to live so close to Yellowstone National Park and so much mountainous beauty, but there is no denying that all this natural splendor attracts a lot of visitors that are just passing through and need a roof for a night. I used to love these pop-in visits, before my spare rooms were filled with kids. Now, it’s a scramble to find space for visitors, but the hostel should help. The only other inexpensive options, campsites and Forest Service cabins, tend to be booked well in advance and hard to find at the last minute. The previous Bozeman Backpacker’s Hostel on Olive Street closed permanently, leaving the area’s happy wanderers with no place to rest their heads. The new hostel will surely provide a welcome roof for many of the summer’s backpackers. Some of the rooms are private, while others are shared. Sharing a room with a stranger can be a unique and enlightening experience. Sure, they may snore or keep odd hours, but chances are, they have an interesting story to tell. Stories are infectious in hostels and most guests have a few more to tell once they leave. You might meet someone who has been biking across the country or someone who has been traveling overseas. Hostel stays are a unique experience and one that is difficult to find in the state of Montana. Other than a few youth hostel rooms in West Yellowstone’s Madison Hotel and Gift Shop, the new Bozeman Backpacker’s Hostel is the only hostel in the southern part of the state and anywhere near Yellowstone National Park. Most of Montana’s other hostels are concentrated near Glacier National Park; one other is located in Fort Benton and one is on the plains of Ingomar, a small, eastern Montana town with a resident population of nine people. Once your guests have exhausted their stay in Bozeman, send them to Montana’s most serene hostel, the Granite Park Chalet in Glacier National Park. Now a National Historic Landmark, the chalet was built in 1914 by the Great Northern Railroad. It now has beds for hikers, a full kitchen, and a dining room with stunning mountain views. Perhaps its best feature is its inaccessibility. It is a moderate, seven-mile hike from the park’s Logan Pass. Boisterous bar crowds and rumbling vehicles will seem a distant memory. Granite Park Chalet visitors need to pack in their own food and bedding, but can use the kitchen facilities to make meals. There is a linens service for those who don’t want to pack in bedding, and packaged meals are available for purchase during the summer. Between the Bozeman Backpacker’s Hostel and the Granite Park Chalet, Montana visitors will see all that the state has to offer. The hostel in Bozeman gives guest access to western city life with its proximity to fine restaurants and museums, while the hostel in Glacier gives guests a taste of Montana’s tranquil wilderness. 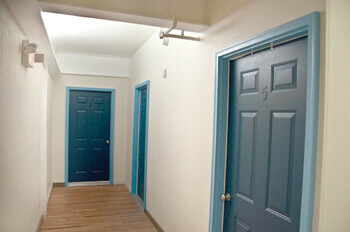 For reservations at the Bozeman Backpacker’s Hostel, call 406-580-3330. For reservations at the Granite Park Chalet, call 888-345-2649. Dorothy was right when she said there is no place like home. Several businesses became established near the railroad tracks, including the Bozeman Canning Company in 1917.